1. the soup is not a 'one-step' preparation thing as most instant soups are. when you peel back the lid, there's a packet of spices inside that you must remove and open, and pour into the cup, before you add hot water. i always seem to spill this powder onto my countertops, as the 'tear line' isnt clean either. i don't understand why this additional spice packet is not just in the cup of soup to begin with, as it is dry powder just like the soup mix. weird. We all know no packaged soup--canned or cuppa--is gonna be as delicious as the fresh, home-made stuff. Still, convenience is worth a bit of sacrifice, for those rushed or lazy days. I ordered this because 1. 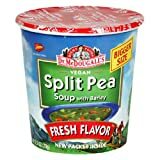 I like split pea, it's like a filling, comfort soup and 2 I wanted to try a vegan soup (no ham or the other stuff that they usually put in pea soup). I didn't expect much. I expected ADEQUATE, no more. Well, surprise me. This was TASTY. I am very pleased with this dried/cup soup. If you follow instructions precisely, it should come out with a terrific texture (not too runny, not too thick) and a nice pea flavor. My only quibble is that it's on the salty side (though not eye-crossingly so). I would definitely get more of this. I'm gonna go through this case pretty fast, I can tell you. 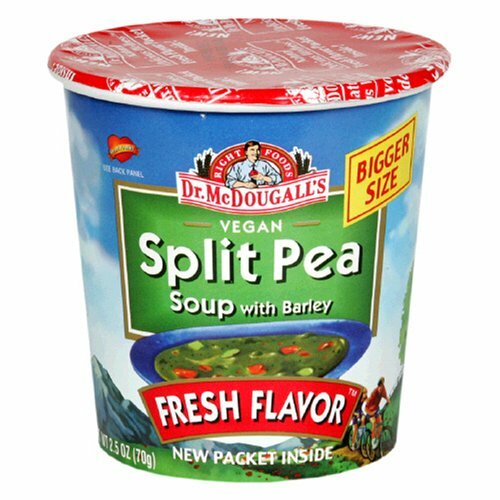 I'm ready to try more of McDougall's vegan soups. If others are as good or better than the Vegan Split Pea with Barley, then I'm in for some nice convenience lunches. Each container has 240 calories (that's considered two servings, but please, who eats just half? ), 10 grams of fiber, 16 grams of protein, 1 gram of fat (no trans fats), and 42 carbs. The sodium count is 600mg. 24% of Vitamin A requirement.